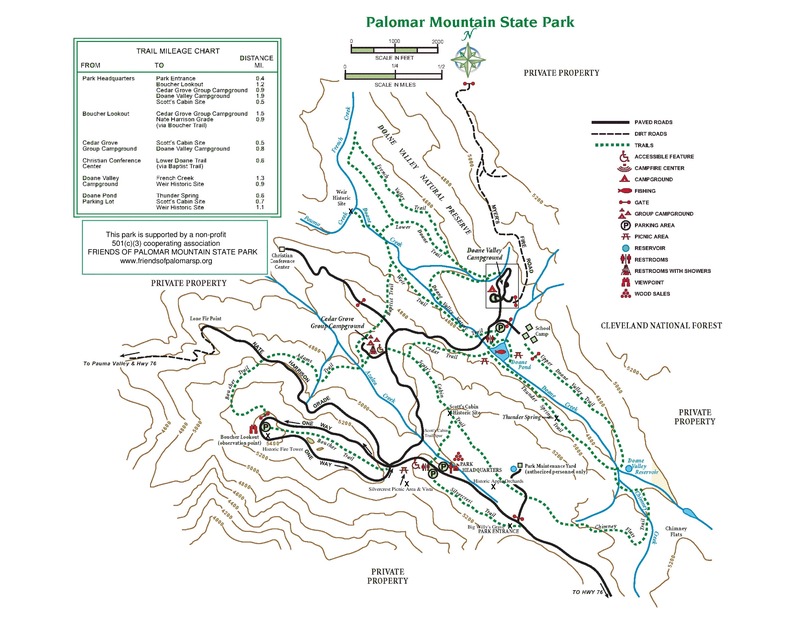 ﻿Download a park map to see where these points of interest are located. Silvercrest Vista Park your car at the Silvercrest Parking Lot just past the kiosk. Whether the sky is clear or blanketed with clouds, you'll almost always enjoy a spectacular view. On a clear day you can see as far away as Catalina Island and the Coronados. Nate Harrison Grade A rugged dirt and asphalt road that starts on State Road 76 in Pauma Valley and winds up in the park. Named after Nathan Harrison, a black slave who came to California during the gold rush and took up residence as a free man near the eastern edge of the present park in the 1860s. Condition is unpredictable, especially in rainy season. Lower Doane Valley This is an area of the park that resembles the Sierra Nevadas. Beautiful meadows with majestic conifers. Look on the northern section of the park map for French Valley Trail and Lower Doane Trail. Scott's Cabin Historic Site Remains of an old-timer's cabin. On Scott's Cabin Trail. Old Homestead Apple Orchards The original root stock of many of the existing trees is well over 100 years. Look to the right just as you go past the main entrance sign. Historic Boucher Fire Lookout Tower There has been a fire lookout on Palomar since 1921. The current building was built in 1948 and refurbished in 2013. Details here. Doane Pond Spring-fed pond holds a variety of wildlife, including water fowl, frogs and trout. Anglers welcome, but note that California regulations apply. Details here. Picnic areas along bank. Thunder Spring You can see the water gurgling out of the earth and running downhill to feed Doane Creek. Flows year-round, even during drought conditions. Right off Thunder Spring Trail. Can't miss it; cuts right across the trail. Never drink untreated water, regardless of how clean it looks! Weir Historic Site A weir is a low dam built across a river or creek to raise the level of water upstream, or to regulate its flow, or to simply measure its flow. This site includes an old water-gauging station where Pauma Creek is formed by the confluence of Doane Creek and French Creek. At the end of Weir Trail. *Note: Rocks are very slippery. Doane Valley Nature Trail One of the park's most popular trails and a great place to see the wide variety of plants that grow in this region. Learn about their characteristics, their habitats, and the many ways they have been used by people over time with a self-guided tour. ﻿Download brochure here﻿. Morteros Depressions in rocks created by early Native Americans for grinding acorns and other nuts and grains. Scattered throughout the park; the one most easily accessible is found in the Silvercrest Picnic Area. CCC Tour Check out a part of the park's early history with a Civilian Conservation Corps Heritage Tour. Details here. Myers Fire Road More of a trail than a road, and the only "trail" in the park where you can walk your dog (leash required, maximum 6'). Most visitors are unaware of this gem. Starts beside Campsite #9 in Doane Valley Campground. Gated for vehicles; foot traffic OK.
Band-Tailed Pigeon If you hear an owl-like hooting during the day or an unusually loud flapping of wings erupting in the tree canopy above, chances are it's a Band-Tailed Pigeon. Learn more about this fascinating bird that Palomar is named after. Big Willy's Grave - Grave of William Pearson, a homesteader tragically killed in 1898 by a falling tree. On Silvercrest Trail, about two minutes from the park's entrance.